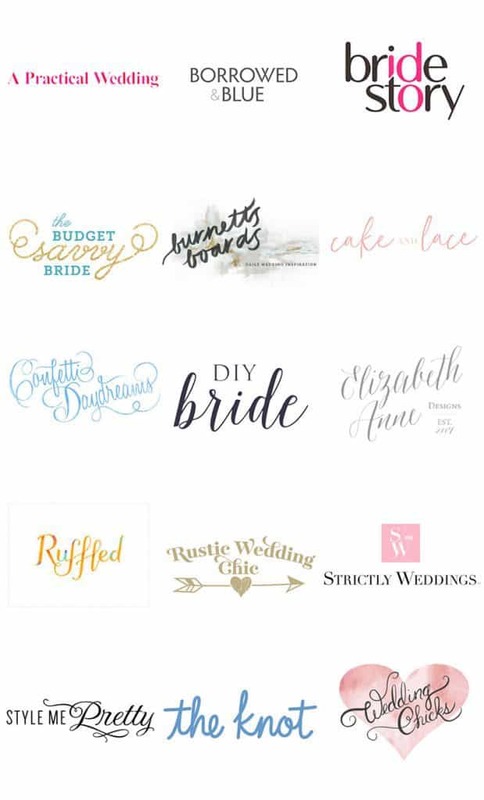 We’re ready to break out the bubbly because we’ve been honored to work with a few wonderful companies over the last month to bring you the latest in wedding news and trends. From 2019 wedding trends and a pre-wedding checklist for brides to royal hotel weddings and a featured real wedding, we’re over the moon to share this Blooms News with you! Of course, we want to say a big thank you to SheFinds, My Hotel Wedding, Zola and Sunset for featuring Blooms by the Box and allowing us to be a part of your work! There’s no question that with the influx of wedding inspiration you receive on a daily basis, it’s easy to get overwhelmed to even begin planning your big day! 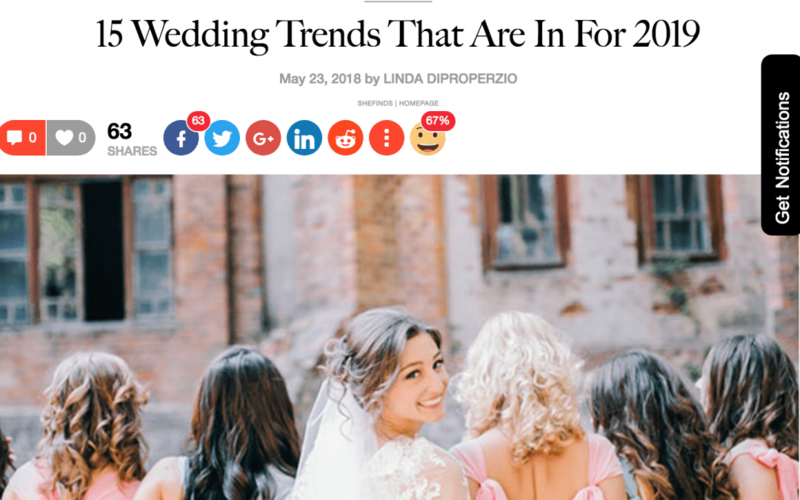 This reason is exatly why we worked with SheFinds on their article covering the top 15 Wedding Trends That Are in For 2019 for all of you lovely brides and grooms saying “I do” next year. From attire to food and everything in between, SheFinds has covered it all, and of course, we couldn’t be more thrilled to include trendy 2019 wedding flowers. You can read the full article by browsing here. We know you have countless things to do leading up to your wedding day. While many of them will be checked off on the day of, there are still a few things you need to do before you walk down the aisle. Thankfully, we’ve given our input with SheFinds to create the ultimate pre-wedding checklist! This list covers everything you should do on the big day, and trust us – many of us wish we had this list in our back pocket. 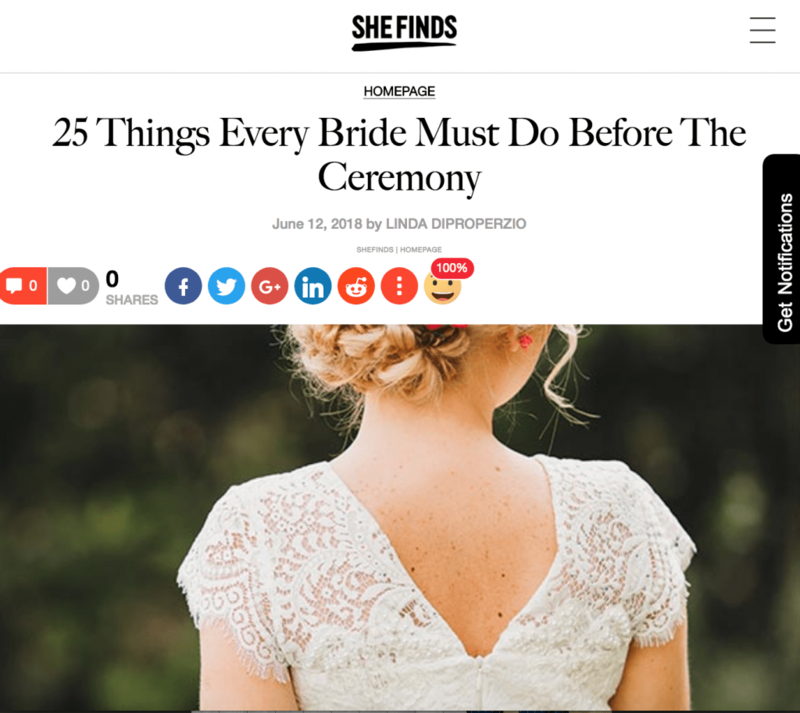 Access the 25 Every Bride Must Do Before the Ceremony by visiting SheFinds website here. Anyone else catch themselves daydreaming over the Royal Wedding? We know the feeling! 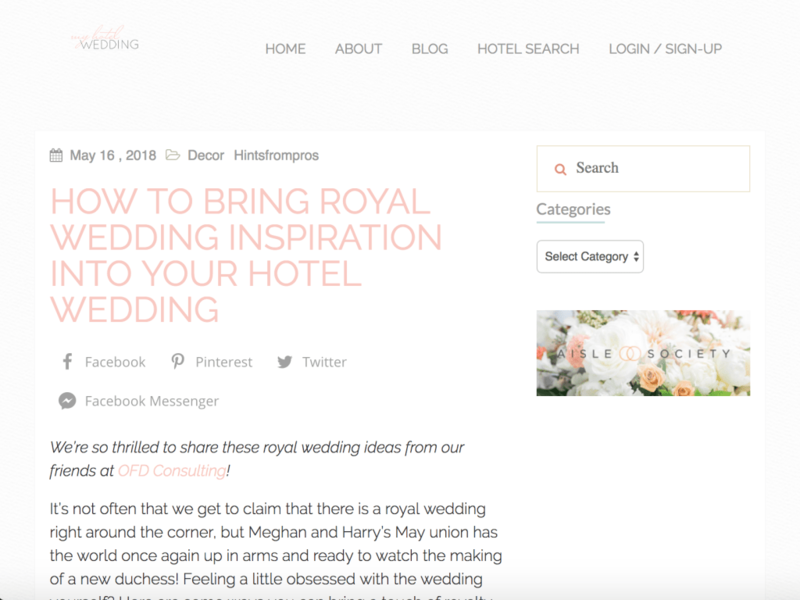 And, if you’re planning a hotel wedding, then we have your next favorite light reading piece because My Hotel Wedding recently published How to Bring Royal Wedding Inspiration into Your Hotel Wedding. Our own, Joan Wyndrum, helped with the article and you can dive into all of these details to add a touch of royalty to your wedding by clicking here. Color palettes are the perfect complement to a wedding theme and style. 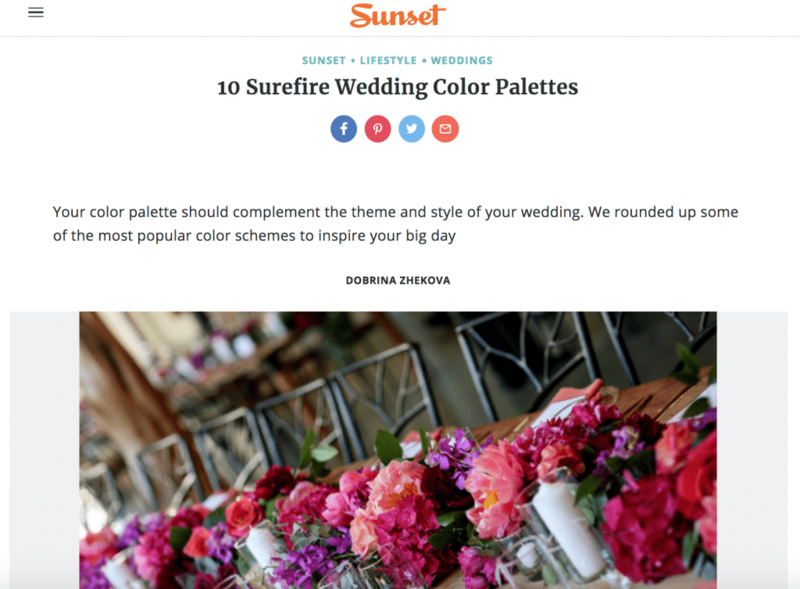 Sunset has rounded up the ten most popular color schemes to help inspire your wedding flowers, decor, and more! Our own, Danielle, gave the perfect tips on how to incorporate jewel tones as your primary wedding color palette – especially when it comes to blooms. Check out the full article by Sunset by browsing here. There are romantic weddings, and then there are romantic weddings like Jillian and Zachary’s. Their lovely Hawk Hollow Golf Course wedding was recently featured on Zola, and we were very honored to supply all of the blooms and greenery for their beautiful wedding day. Outfitted in coastal blue hues and pink roses, whimsical eucalyptus, and white ranunculus their wedding has made it to the top of our list of favorite weddings! 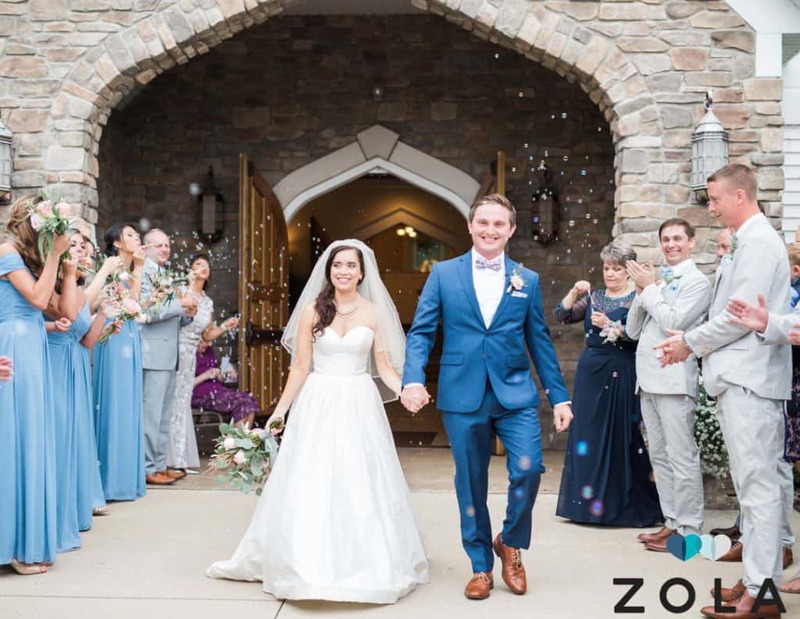 Be sure to visit Zola by browsing here to view Jillian and Zachary’s wedding as captured by Meghan Hannon Photography.